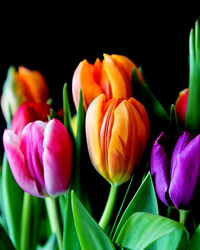 Obituary for Ann (Belich) Belich | Bohn-Matich Funeral & Cremation Services, Inc.
Ann Belich, 95, of Ambridge, died Wednesday, April 10, 2019, at Brighton Rehabilitation and Wellness Center Born October 23, 1923, in Ambridge, a daughter of the late George and Yelitsa Yurich Belich. She was retired from the former A&P. Surviving are her twin sister, Helen Belich, Beaver; two nieces Emma Mio, Ambridge and Annmarie and Steven Norris, Indiana; one nephew, George Castellon, Moon Twp. ; two great nephews, Eric Mio, Illinois and Christopher Dugan and one great-great niece, Olivia Dugan, Indiana. In addition to her parents she was preceded in death by two brothers, Sam and Adam Belich and one sister, Mildred Castellon. There will be no viewing, Interment will take place at Economy Cemetery. BOHN-MATICH FUNERAL & CREMATION SERVICES, INC., 1099 Maplewood Ave., Ambridge, were entrusted with arrangements.